When you need a better garage, you can rely on Custom Garage Works! 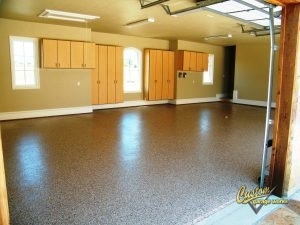 In 2003, we began offering high quality garage floor coating in Venus, TX after we needed more out of our own garages. After looking high and low in the existing industry, we were shocked to find very few options that were up to a top quality standard, so we got into the industry ourselves, to turn things around. Presently speaking, we are proud to provide our clients with some of the greatest garage storage solutions on the market, as well as floor coatings that are tougher and longer-lasting than traditional epoxy. Our contractors are professional trained, and we are passionate about creating custom garages, with impressive garage floor coating results across DFW. Rising in popularity with each additional year, our garage floor coating in Venus, TX is among the best you can find in DFW. This boom in popularity is probably because our coatings are more durable than epoxy, and cure faster, which means that you can drive in your garage within 24 hours in most cases. While with epoxy floor coatings, you have to avoid UV exposure and watch out for flaking, our polyurea-based floor coatings are significantly more durable. And thanks to our use of a diamond grinder instead of risky acid etching for floor prep, we can offer a greater amount of adhesion, which leads to a quality installation. If you’re interested in learning more about our garage floor coating service, you can schedule your free estimate when you call 214-494-9068 or 817-308-1305. Garage Floor Grinding Our garage floor grinding method is the best system to properly prepare your concrete for a coating system. When you choose a storage solution from Custom Garage Works, you never need to shuffle through mountains of clutter in your garage again. 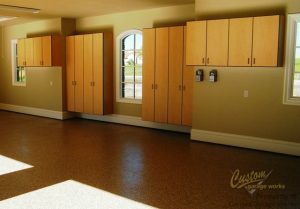 We recognize your new garage floor coating looks better when it isn’t covered by a mess of belongings! We have many solutions to your garage organization problem, including garage cabinets and overhead storage racks. Designed specifically for garage use, our storage cabinets are among the greatest in the business, and our storage racks are designed for high capacity storing. If you need a reliable garage floor coating in Venus, TX, and unbeatable organization solutions, you can count on Custom Garage Works. Overhead Storage Racks When you want to get the most out of your overhead storage space, our durable storage racks are a fantastic place to begin! Storage Cabinets Unlike kitchen cabinets, ours are designed specifically to help you get the most from your garage space!